As White House and Pentagon agitation continues against Iran and news spreads that the US has been involved in covert funding of Sunni insurgents and terrorist groups, fomenting civil war throughout the Middle East, what happens? Stocks plunged in New York today after a sell-off in China rattled markets worldwide and surprisingly weak economic data fanned fears that the economy may be more vulnerable to a downturn than widely thought. The broadest measure of stock prices, the Standard and Poor’s 500 stock index, lost nearly 3.5 percent of its value today, its biggest drop in three and a half years. 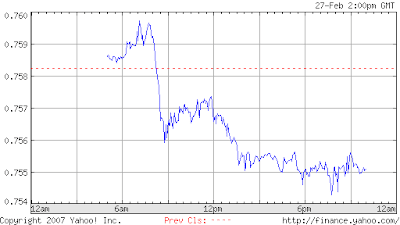 The Dow Jones industrial average fell 3.3 percent, or 416.02 points, to 12,216.24. Both indexes later regained some of their value, but their gains for the year had been wiped out by today’s close. I feel confident in saying that the experts who think "widely," will poo-poo any notion that there is some relation between the Chinese market sell off and the unstable geopolitical stage, if they even recognize a possible causal connection or not. In fact, they immediately declaimed that, why, it's all just "another day in the market" and offered myriad reasons for this behaviour. Nothing to see here, folks. Nonetheless, what should be sparkling clear is that when China twitches, the world shakes.